The description of Hyperide: Vector Raid states this $3.99 Nintendo Switch eShop title has been inspired by classic River Raid and Tron. However, a more accurate description would be if this title sought inspiration from elements called annoyance, a waste of time, and not fun. Playing as a space ship flying into the screen at a high speed sort of like Star Fox, the only means of input is through the use of the analog stick to control movement; the face buttons and triggers are not used. The gimmick here is the player needs to stay within a light trail to power the ship’s battery and reach the end of the stage. Stray too far off for too long and it is game over. 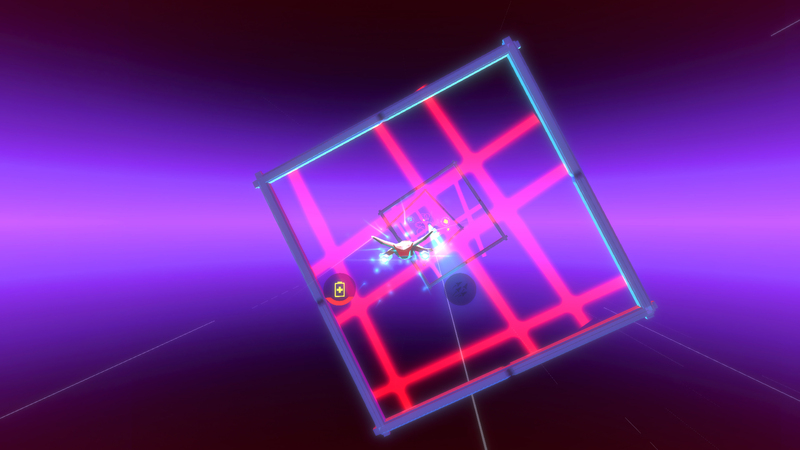 Bumping into objects depletes the energy bar faster so the main gameplay element becomes avoidance. The sense of depth is also inaccurate making gameplay more difficult than it needs to be. Although there are numerous issues with this downloadable title, the biggest is the lack of overall content. There are a total of four stages, the last being an impossible endurance match against a boss. Skilled players can finish the entire game in about ten minutes with zero replay value. There are no high scores, no fastest times, nothing to unlock. With no meat on the bone, this game feels like a lazy demo more than anything. The final stage is a boss battle that uses nothing but cheap tactics to constantly destroy the player. In fact, the only way I was able to complete this final stage was through a welcomed glitch. My ship actually blew up the same time the boss was transitioning, causing my ship to respawn with infinite health since the game thought I was already dead. If it wasn’t for this glitch, I would have never seen the ending credits of this ten minute game. Even if the game breaking glitches were fixed, it is still unbalanced, contains some stupid dialog boxes that quote bad Star Wars and Zero Wing lines, and is never fun. No effort was spent in this product. During the credit roll, pizza and coffee there thanked. There is zero replay value. The gameplay is a joke. The presentation, from the opening menu screen to the bad profile art and absence of audio, is outright terrible. This is easily one of the worst games on the Switch eShop.